Introducing better / greener nail colour. Easy peasy. No smell. No spill. Fast to apply. Simple to remove Unisex nail colour that lasts. Did we mention it's non-toxic? Expressing yourself has never been so good. Traditional nail polish closely resembles car paint. These lacquers typically contain DBP (Dibutyl Phthalate), Toluene and Formaldehyde and if you're looking for long-lasting, chip resistance, add Parabens and TPHP (Triphenyl Phosphate). Camphor adds the nice shine while Lead is to thank for bringing you bright, vibrant Reds that "pop". The Toluene is a solvent which softens your nail for bonding and is a VOC (Volatile Organic Compound) which is the smelly part of the polish while it is drying. Toluene is the reason polish is liquid. There are a few companies offering nail polish that contain fewer chemicals or are water based, but they don't stand up to daily wear and tear. As well, the remaining chemicals used in these products raise enough concerns that they are not options for our family to use. Made from thin PVC it revolutionizes how nail colour is used. 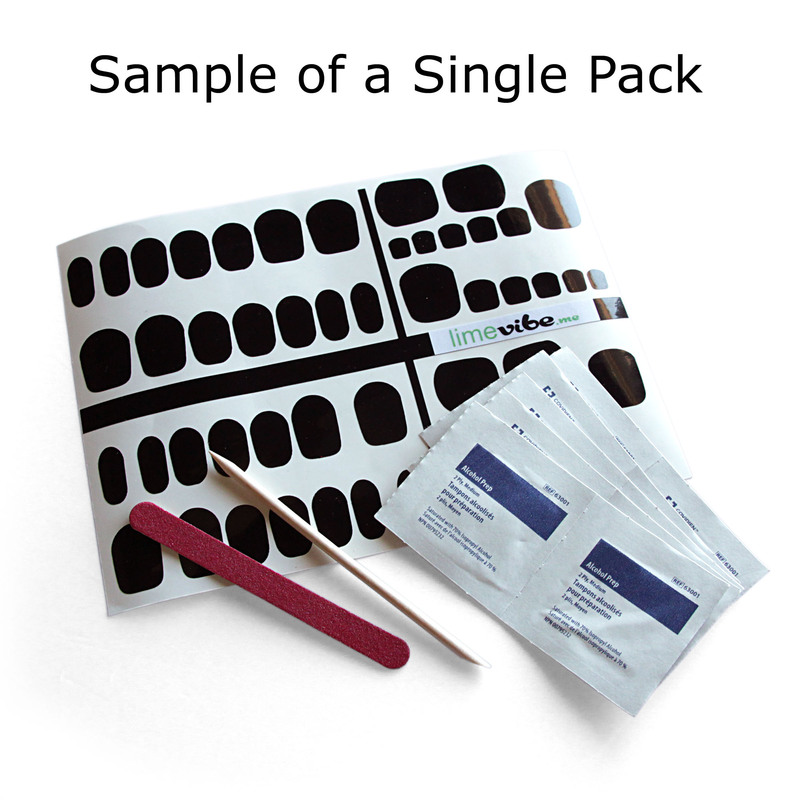 No more wet nails, crooked lines, spilled polish, polish remover, fumes or headaches. 15 minutes gives you awesome unisex nail colour for up to 2 weeks. Once you're done, simply peel them off. No fuss - No muss! In a perfect world, yes! Like all plastics, it shouldn't exist - It is persistent in the landfills and the process of making it uses Phthalates. Having said that, the water pipes in your house, shower curtains, your gym bag, soles of your shoes, vinyl flooring, drinking glasses, the dashboard in your car, and your kid's swimming pool along with the garden hose used to fill it - are all made of PVC. To put things into perspective, a gift card to your favourite coffee shop contains enough PVC to cover your nails 32 times. Hospitals use it for IV tubing, blood and saline bags and the last time you used a latex-free band-aid...it was probably made of PVC. As a family that promotes the use of toxic free body care products, we're excited about Lime Vibe as a way people can express themselves. We hope you'll agree. In addition - the Lime Vibe sheet is completely recyclable in curbside recycling. The backer sheet is simply paper and the nail colour is straight PVC which is the simplest of plastics to recycle. Heating and melting is all that is required to reclaim the PVC and it can be done 100's of times over. Producing better / greener nail colour. Easy peasy. No smell. No smell. No spill. Fast to apply. Easy to remove. Perfect nail colour for all genders that lasts. Did we mention it's non-toxic? Expressing yourself has never been so good.